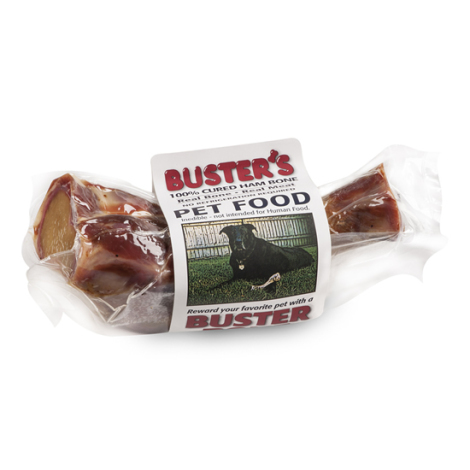 Reward your favorite pet with a country-cured 100% ham bone with meat. Fully cooked and USDA inspected. Requires no refrigeration. Three large Buster Bones. These ham bones are salt-cured - be sure to provide your pet with plenty of drinking water during consumption. Product is salt cured. Always be sure your pet has plenty of water. Monitor your pet while consuming any natural bone. Remove bone and discard if splintering occurs. We bought this bone for our little Dashund on our way home from Florida. He usually does not eat bones, he does not like them. The bone was almost as big as he was, but he never let it go until he chewed it clean. He only interrupted his feast to drink a bowl or two of water. Took him a full day and he is still carrying the bare bone around the house, trying to hide it. We need more!